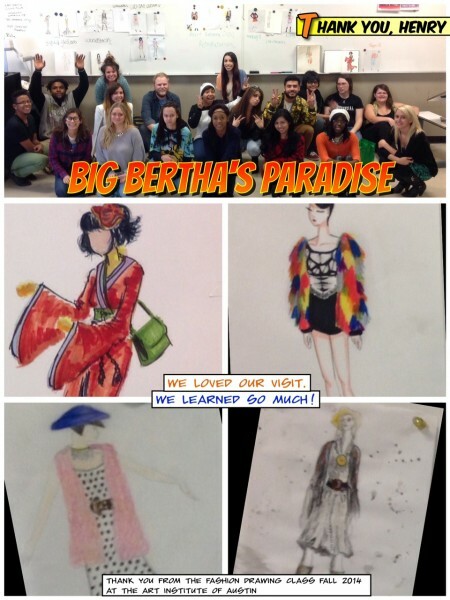 Henry Tarin at Big Bertha's Paradise hosted a field trip for my students to style a mannequin with a fully-accessorized look, then take photos to draw from. Each team started with a different theme and Henry helped make each outfit Wow-worthy! Here is the class with the resulting photos. I used the Comic Book app on my iPad to build the Thank You card. Taking the students to a real-word working fashion store helped them to get a real feel for how different textures and combinations of pieces come together to tell a story. Henry is a master of fashion story-telling and my students all came away with more knowledge than they expected.